Many of the questions that we get asked on a regular basis relate to understanding exactly what is an "explosion-proof" light. Customers often confuse this terminology with other labels that they've heard before, or often have not had the function of the light explained to them. Let's try to clarify some of the confusion. First off, let's talk about the general usage. Explosion-proof lights are designed to be used in a "Hazardous Location," as defined by the Canadian Electrical Code as well as other codes or regulations across different jurisdictions. Broadly speaking, a hazardous location in this context is an area where there are high enough concentrations of combustible materials in the air to cause a fire or explosion. This could be in the form of a gas (e.g. natural gas, ethanol, toluene, etc), a dust (e.g. grain, flour, coal, etc), or even a fibre. When these hazards are present, workers need to (by law) use specially designed equipment to reduce the risk of igniting the flammable materials lest they cause a catastrophic fire or explosion. For more background on the classification of hazardous locations, see our quick primer on the topic here. One of the pieces of equipment often used in these areas is a portable light. Imagine you are going into a massive tank that used to contain gas in order to clean it out and inspect it for damage. This tank is still going to contain combustible gases long after all the liquid fuel is gone, and as such you'll need to protect yourself. However, the tank is dark inside so you need to bring in a light with you to allow you to see and carry out the job. Since this is a hazardous location, you will need to have a light that can reduce and minimize the chance of igniting the gases (or dusts, depending on the location). This light can come in two basic configurations, explosion-proof or intrinsically safe. All electrical equipment certified for hazardous locations can either be certified as explosion-proof or intrinsically safe. The aim is similar; to reduce the ch ance of igniting the flammable materials. However, the approach is different. Explosion-proof lights (like our XP162 light shown here) are designed to withstand an ignition of the flammable material that happens inside the light itself, whereas intrinsically safe lights are designed to not carry enough current to cause a spark that could ignite the flammable material. To be certified, explosion-proof lights typically will be made of durable, non-sparking material, a very thick glass globe over the bulb, and other features to ensure that the worker and the surrounding environment remains safe should an ignition occur inside the light. We won't go into the details here, but this is a real feat of mechanical engineering to accomplish this. As it should be! We are talking about people's lives at risk. To be certified, intrinsically safe lights will typically be battery-powered and have such low voltage traveling through the circuit that a spark arcing through the air could not happen. A good example to think about is a specially designed battery-powered flashlight. So as you can see, the terms explosion-proof and intrinsically safe are similar in their goal, but very different in their application. We should take a second to pause here to stress that all products used in hazardous locations MUST BE CERTIFIED by an approved certification body (e.g. in Canada and the USA: UL, CSA, ETL, etc) for the exact type of hazardous area that it is being used in. You will need to know the Class, Division and Group (or Zone as it becomes more widespread) applicable to the location and use a device specifically approved for those criteria. For example, do not use a light certified for Class I, Division II when you really have a Class I, Division I area. Similarly, don't use a Zone 1 classified light in a Zone 0 location. More on this in a later post. There are some common misconceptions about explosion-proof lights that are worth addressing. For example, many people assume that an explosion-proof light works by blocking out all gases or vapours so that they can never come in contact with live electrical power, even if the light were to break. That is typically NOT the case. Explosion-proof lights do not have to be "air tight" to perform their function. Many explosion-proof lights will allow gases into the light itself. The important part of their construction is to prevent any explosion caused by those gases from escaping to harm the worker or further ignite gases in the work area. So before submerging your explosion-proof light to clean it off, it's best to check with the manufacturer to see whether this is acceptable. For example, some of the lights we sell can be power-washed and others are not water or vapour-tight. On the flip side of this issue, many non-explosion-proof lights are for sale that are "vapour-proof" in their construction. It's important not to assume that these lights are also explosion-proof as most are not. 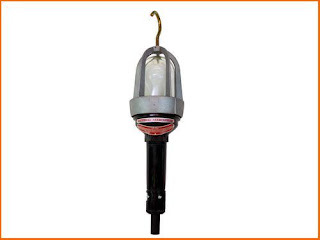 An explosion-proof light needs to be certified as explosion-proof and that should be prominently displayed in any sales materials and certainly on the product itself. Remember, not every vapour-proof light is explosion-proof, and not every explosion-proof light is vapour-proof. Make sure to ask to ensure you are getting the right tool for the job. This is a quick overview of the use of the terms explosion-proof and intrinsically safe as they apply to portable lighting products. If you have any questions, or want clarification, please feel free to reach out to us.